Protesters on the steps of Portland City Hall on Tuesday. 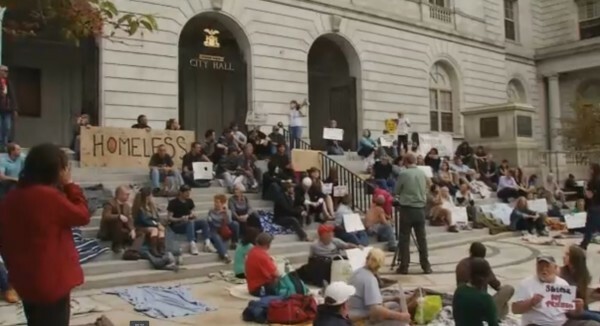 PORTLAND, Maine — A demonstration took place in Portland on Tuesday with the goal of bringing attention to what organizers said is a serious problem for the city’s homeless. Dozens of people gathered in front of city hall. Some laid on blankets on the ground to prove a point. The city recently cut shelter services and protesters want them to know how big of an impact that would have. The city decided to close the overflow shelter at Preble Street. That means 75 people who normally sleep there at night will have to go somewhere else. They’ve also cut a program that provides motel rooms for homeless families with children. The city said the cut was necessary and stems from cuts at the state level but protesters said the city should find another way to save money. The city said previously they received $8.6 million from the state to go towards shelter costs, but in 2016, they’ll only be reimbursed $3 million. “Because of a drastically reduced reimbursement for those kind of services the City of Portland is forced to make decisions and we have to bring in a balanced budget at the end of the day,” said Michael Sauschuck, acting city manager.